GET EXCITED! THE RESULTS ARE IN! you have your mind ON your money and your money on your mind. and it shows. To you Instagram is all about business. Instagram is your very own digital flyer. It's your opportunity to post about homes just listed, products for sale, industry tips and tricks, client testimonials, and of course your contact information so leads can call you ASAP! But Instagram shouldn't be all about the sell! It's about putting yourself out there. Hold up: does this sound like you? If you're like “no way Kary”, then check out the other results. These quiz thingies aren't perfect so forgive me if i totally got you wrong. blame the quiz not my heart. Hey Pusher, want to learn how you can step up your game? I know you must be wondering: Why am I not getting leads from Instagram? What's with all the unfollows? Why aren't people liking my posts? What am I doing wrong? Marketing your business on Instagram takes a perspective shift. When you are trying to attract clients online, it's not a never-ending sales pitch, it's an exercise in trust building. Your followers are on Instagram to engage with other human beings NOT businesses. They are looking for meaningful interactions not sales pitches. Plus, you kinda don't have a choice but to play the game. With recent changes in the algorithm, Instagram is de-prioritzing content shared by businesses in favor of content produced by friends and family. You have to be social on social media! You have to put an end to the daily sales pitch. Every post cannot be just a means to an end. You have to start really connecting with your followers. You have to focus on connecting and serving before you sell. Instagram is about building relationships. Let's be real...have you ever had a client hire you without talking to you first? Have you ever hired someone without at least having a conversation with them? So why do you expect your ideal client to just slide into your direct messages without even the slightest bit of personal information or engagement? A conversation is the start of any good relationship and in order to get your clients to know, like, and trust you; they first gotta talk to you. But you have to open the door and invite them in for conversation. When done right, photos of yourself and insights into your personal life in your captions will act as the perfect conversation starter and potential starting point of profitable client relationship. Below are three ways to build trust and foster connection, which believe me, always leads to more sales. It's time to stop spamming and start connecting. You are the face of your business so your face needs to actually show up in your feed. Make sure to post at least 3 photos of yourself in every 9 posts. When you do post work-related photos make sure to always put building a relationship before sales. Give your followers some insight into why these posts are helpful. Don't just post and ghost! Ask your followers a question in your posts and stick around to respond to their comments. Also, comment on other people’s posts. I am a big city girl with even bigger dreams! Realtor, designer, marketer, educator and unshakable optimist. Digital marketing expert, branding genius, and straight up girl boss motivating the hell out of other entrepreneurs to build their business online so that they can work less and live more. I quit my corporate job nearly 4 years ago and built several profitable businesses along the way using digital marketing strategies that I now get to share with the world. I am here to help you brand, market and grow your online business in a ridiculously badass way. Let's do this! wanna start killin' it on the gram? 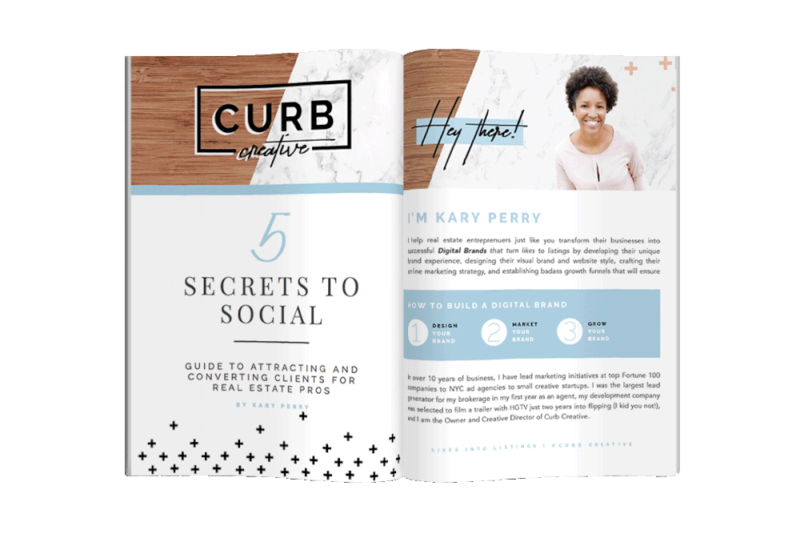 The real estate pro's guide to creating content that attracts your ideal audience, turns them into engaged followers and successfully converts them into paying clients. I'll give you 5 ways to quickly grow your Instagram following with the right people that will help you grow your brand AND your profits. Learn what I did to build my Instagram account to over 15k followers with my dream clients! Oh yea, i want in on that!